I've always had strong views--against self publishing. I know I'm not alone. I thought that authors only self published their books because they couldn't get published traditionally. I thought their work wasn't edited, polished, or professional. I thought the books weren't published for a reason. And I'd never read one. Call me a hypocrite. It's OK. I was one. Then something happened. 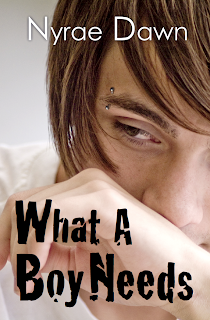 I read What a Boy Wants by Nyrae Dawn. I'm not going to lie, I was pleasantly surprised. I was not expecting the story to be so good. The book actually knocked me off my feet. I have actually read several self published books now. I bet you have as well, you just haven't noticed who the publisher was on that book you 1-clicked on Amazon. So, now I have different views on self publishing and I'm going to share them. 01. I'm really surprised by the originality in self published books. They are way ahead of the mark. If you find yourself in a reading rut, I'd seriously encourage you to pick up a self published title. Get yourself out of the norm. The story lines can be fresh and enjoyable. If you're looking for something different self published books are a good way to go. 02. I still think self published titles are unedited and unpolished. Not all, I'm sure. But overall. Yes, it is true, these are my feelings. Even when they don't have a ton of grammatical errors, they aren't as polished as I'd like. You can tell they were written quickly. I think it is important to take the time to write well. Not just throw something together. Even if you can write 60,000 words in 2 months doesn't mean it is ready for publication then. Sending it out to more than just friends and family to "edit" would be my first call. Fresh eyes could really see inconsistencies and help with plot development. In my opinion. But it doesn't mean that the storyline still isn't good. 03. They are shorter. That's a simple thought I know, but they are! This can be a good thing. Sometimes I like to sit and read a book in one sitting. I know that I can do that with a self published title. Quick and to the point. 04. The covers are getting better and better. I bet I could put a few self published titles up here mixed with traditionally published covers and you'd be hard pressed to know the difference. Covers are really important and especially when browsing Amazon I look at covers way more than I read they synopsis. 05. Author Jolene Perry shed some light on why she is self publishing some titles. She already has some traditionally published books and she has just self published a batch of books. I think spreading out your work in different areas is a good thing. There are benefits to it I think. If you've never read anything self published, then try these--my personal recommendations. I personally feel these are some of the best self published titles out there. I would swear they were pubbed by the Big 6. I hope you like them! Open your eyes a bit and try something new. You might be impressed! Do you have any thoughts on Self Published titles? Any favorites? 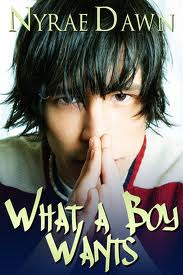 What a Boy Wants was my first attempt (after a really bad half attempt) at Self pub'd books and since then? I've been looking for other good ones. I think the rap is getting a little bit better, minus the outburst on Goodreads from a Self Pub author. It is hard to trust them because you never know what you're getting do you? That's why it is easier to go with personal recommendations from friends/bloggers you trust. I'm always afraid I'll end up with one of the bad ones!! But, I'm getting better and finding that I enjoy the stories a bit better and they seem to be quite creative. I'll send over any more recs of good ones if you do the same for me! Yes, self -published books are a mixed bags, but traditionally published books are really not much better. I coach authors how to get on TV and I can tell you they have no trouble there. Self-published authors tend to really know their material and make great experts on TV interview shows. Check out the morning interview shows for leads on some good self-published books. Thanks, Edward Smith. I totally agree. I'm been unimpressed with traditional publishing as of late. It seems that a lot of mediocre books are being published these days. Self pub titles seem to have all the fresh ideas I'm craving. I hope more people give them a go. After reading your review of What a Boy Wants I had to buy it and read it for myself. You were right! It was absolutely amazing and I ended up buying the second, What a Boy Needs, which was just as good! I don't have anything against self published books, I usually throw a few in inbetween my published reads, which works for me. I think you should definately check out Heavenly by Jennifer Laurens (if you haven't already). Thanks for the rec Michelle! I'll check it out! I'm SO glad you liked What a Boy Wants! I loved it too! I was so impressed that it was self pub that it turned my whole thinking around. I'm enjoying throwing in some self published titles inbetween traditionally published books. It's giving my brain the creative vibe it's craving these days. I wont lie. I used to be Anti self published. Then Jolene had a book that was self pub. That really changed my view and now I read self pub to support them! They sometimes end up being my fav. books. I was very impressed with the Perry cover you posted - wow, it truly is as good as a traditionally published book! I too am biased against self-published books and I doubt I'll try one anytime soon. That said, I actually am an editor and I do edit books that go on to self-publishing (so I have read self-published books, but in reverse order as they were only published after I read them!) I truly appreciate your comment that many more of these self-published books need editing. They do. They need workshopping and honest friend critiques, and then they need a developmental and line edit, and when they are perfect, then they need a copyedit, and after they are formatted they need to be proof read. I truly appreciate the authors who think enough about their own book, and about readers, to really go to that extra trouble and expense to put out a great book, instead of one that's just okay. I'm really glad your experiences have been so positive and that you're enjoying the self-published books you've read.